Without access to food or water, many of the turtles were sick or injured. The Turtle Survival Alliance sprang into action with a call to help save this species. The New England Aquarium’s director of animal health, Charles J. Innis VMD DABVP, is one of many turtle experts who answered the call to help in this massive rescue mission. Here is his account of his experience. 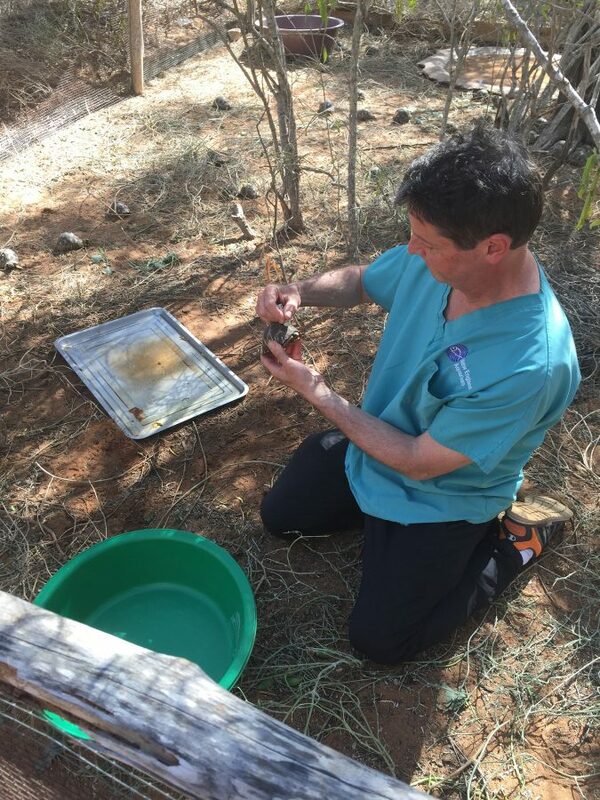 Dr. Innis treats a tortoise in Madagascar. After a full day and a half of travel from Boston, I arrived at the conservation center in Madagascar and started working on May 28, six weeks after the nearly 11,000 radiated tortoises were confiscated. The radiated tortoise is an endangered species found only in Madagascar that is often sold illegally on the international pet trade. These tortoises had been crammed into a home without food or water for an unknown period of time. Under such conditions, as we have unfortunately seen in so many confiscations, the animals lose weight and become dehydrated and weak, and their immune system shuts down. They are open to infection by bacteria, viruses, parasites, and fungi. This group was similarly affected, so ongoing treatments involve re-hydration, tube feeding for those too sick to eat, antibiotic therapy, topical treatments, antiparasitic therapy, and other supportive care. A typical radiated tortoise from the hospital rests in a rehab pen. 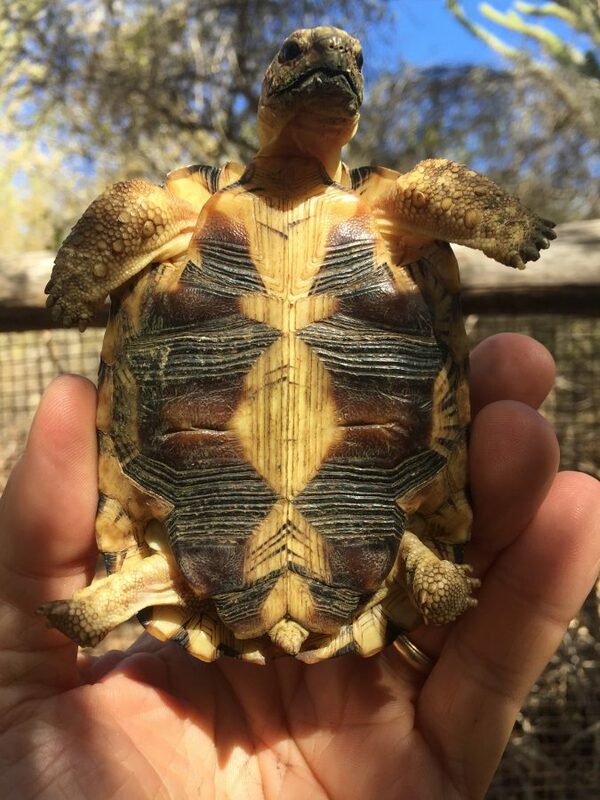 The radiated tortoise is an endangered species, endemic to Madagascar, that holds high value in the international live animal trade. It is listed under the U.S. Endangered Species Act as Endangered. The International Union for the Conservation of Nature (IUCN) lists the species as Critically Endangered, which is defined as being in risk of extinction in the near future. The plastron of a rescued radiated tortoise is examined. 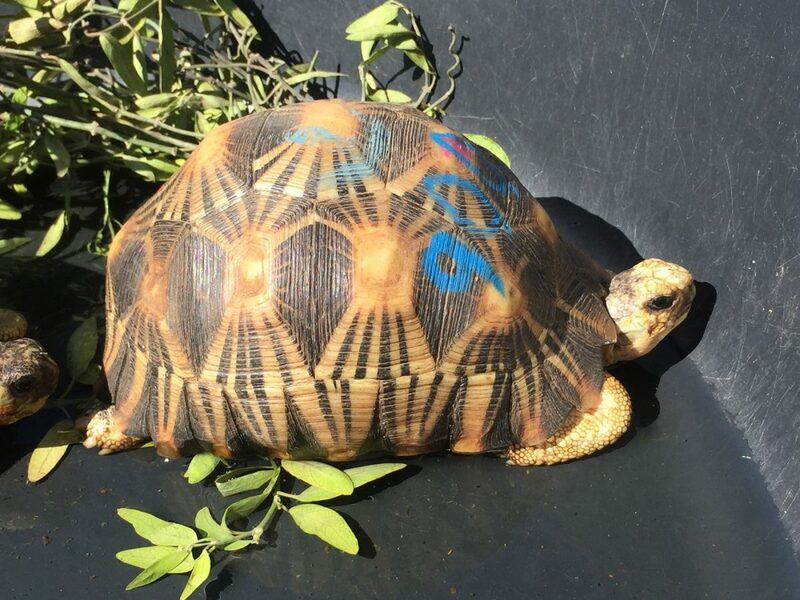 Taking radiated tortoises from the forests is illegal in Madagascar, and international trade is banned in 182 countries and the European Union. Still, this species may sell for several thousand dollars for an individual in the U.S., Europe, and Asia. Poachers often prefer the small turtles because they are just as valuable as the adults but only one-tenth or one-twentieth the weight and therefore easier to smuggle in large numbers. Larger individuals are sold locally and consumed as a food source. Although there are many animals still in the wild, and many animals are held securely in sanctioned zoo breeding programs, the magnitude of the illegal harvest here puts them at risk for extinction in the wild. As seen with many other formerly common species, long-lived species with delayed sexual maturity and low annual reproductive success cannot survive unsustainable harvesting—such as 11,000 individuals in one harvest event. Keep reading! Read Part II of Charlie’s blog from Madagascar to learn more about the day-to-day efforts of the international team of experts he’s part of, which is working to save this endangered species in Madagascar.